This is how movies based on comic books should be made and director Jon Favreau brilliantly brings Marvel Comics Ironman to the big screen and thankfully to Blu-Ray which is now the definitive home movie format. The story revolves around a billionaire industrialist and inventor named Tony Stark who is played perfectly by Robert Downey Jr. and really transforms the character into his own. Stark also has a contract for the American military and when he visits the middle east to showcase his new weapon of destruction, he is kidnapped by a terrorist group and is forced to recreate this weapon. Unfortunately for Stark, he was injured by the attack with tiny shards located around his heart. Yinsin (Shaun Toub), an engineer who has also been kidnapped, creates a magnetic field around Stark's heart via a car battery. Using his ingenuity, he uses the power core of the weapon he created to not only save his life but also create a high tech suit of armour that he uses to escape. Returning to the US, he vows to end Stark Enterprises military contract as he has witnessed at first hand the destruction of his weapons. Stark also learns that his second in command, Obadiah Stane (Jeff Bridges) has taken over his company and builds on the lucrative weapons creation market. Forced to have a "break" from his Company, Stark retreats to his mansion, however keeps his liaison open with his faithful and beautiful assistant Pepper Potts (Gwyneth Paltrow) who is investigating on behalf of Stark how his weapons have fallen into the wrong hands. His only choice is to work on the armour that he created in the middle east as he eventually perfects the armour and the persona of "Iron Man". Without spoiling the movie, Iron Man is a thoroughly enjoyable ride from start to finish with brilliant acting by all involved. Robert Downey Jr. is truly the star of Iron Man as Tony Stark, however the next star is the amazing CGI special effects that really makes this comic come to life. It even stars an unexpected Marvel character at the end of the movie which will make comic fans giddy with joy. To truly enjoy this movie, the Blu-Ray format is a must have as the video quality is exceptional with vibrant colours and sharp images. The 1080p HD Widescreen is almost as good as seeing it on the big screen and match that with Dolby Digital TrueHD 5.1 and it completes the icing on the cake. Once you have enjoyed the movie, it's time to work on the special features that are quite entertaining, interesting and give a great insight into how this extraordinary movie was made from the Marvel comic Iron Man. What can I say? 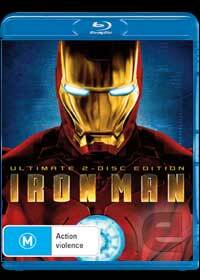 The Onion "Wildly Popular Iron Man Trailer to be Adapted into Full Length Film"